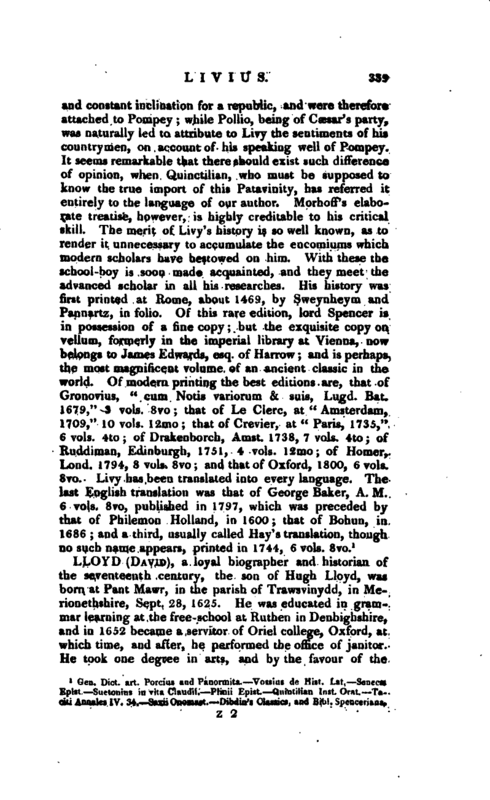 , a loyal biographer and historian of the seventeenth century, the son of Hugh Lloyd, was born at Pant Mawr, in the parish of Trawsvinydd, in Merionethshire, Sept. 28, 1625. He was educated in grammar learning at the free-school at Ruthen in Denbighshire, and in 1652 became a servitor of Oriel college, Oxford, at which time, and after, he performed the office of janitor. 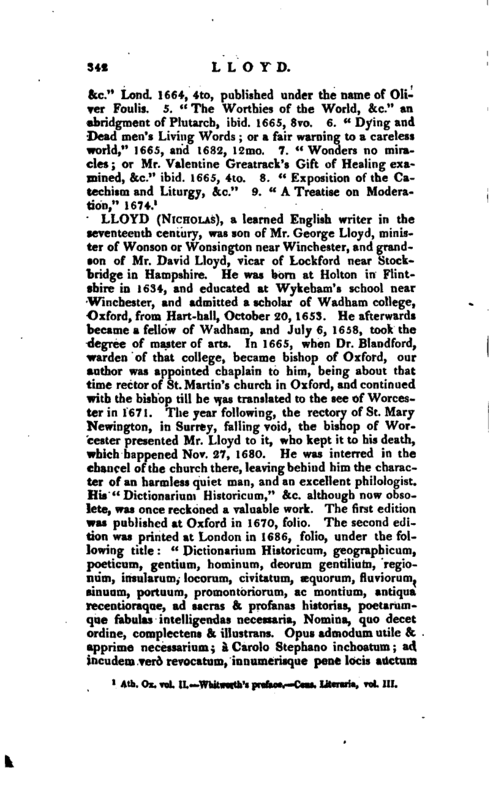 He took one degree in arts, and by the favour of the | warden and society of Merton college, was presented to itie rectory of Ibston near Watlington in Oxfordshire, in May 1658. Next year be took his master’s degree, and after a short time, resigned Ibston, and went to London, where he was appointed reader of the Charter-house. Afterwards he retired to Wales, and became chaplain to Dr. Isaac Barrow, bishop of St. Asaph, who, besides several preferments in his diocese, gave him a canonry in the church of St. Asaph, in August 1670. On Aug. 14, 1671, he was made vicar of Abergeley, and on the same day, as is supposed, prebend of Vaynol in the church of St. Asaph, at which time he resigned his canonry. 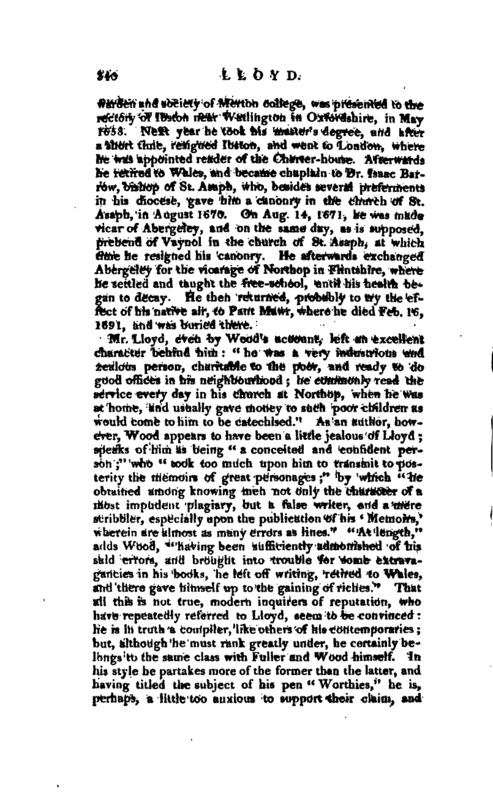 He afterwards exchanged Abergeley for the vicarage of Northop in Flintshire, where he settled and taught the free-school, until his health began to decay. He then returned, probably to try the effect of his native air, to Pant Mawr, where he died Feb. 16, 1691, and was buried there. 1 Atb. Ox. vol. II. 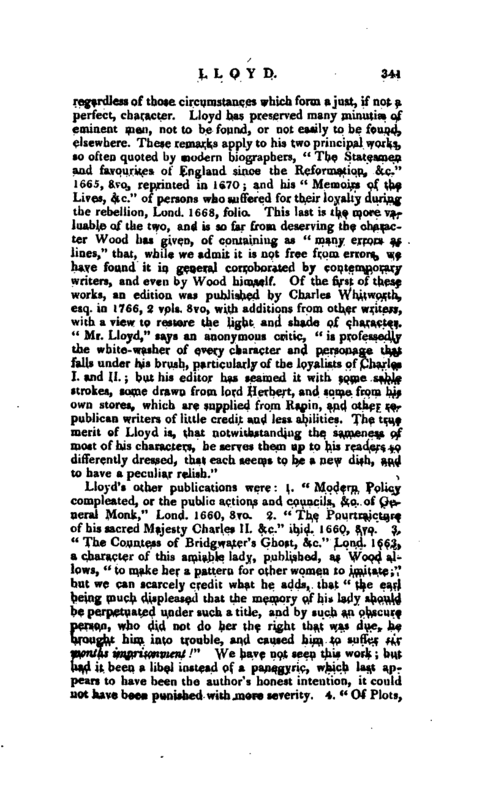 Wbitworth’s preface. Cens. Literaria, vol. III.